The Halsey Taylor OVL-II SER-EE-Q Water Cooler is a modular, electric refrigerated wall-mounted unit. Delivers 7.5 GPH of 50°F water at 90°F ambient and 80°F inlet water and has a 180° push-bar valve on front, contour-formed basin to eliminate splashing and standing water, and rounded corners and edges. 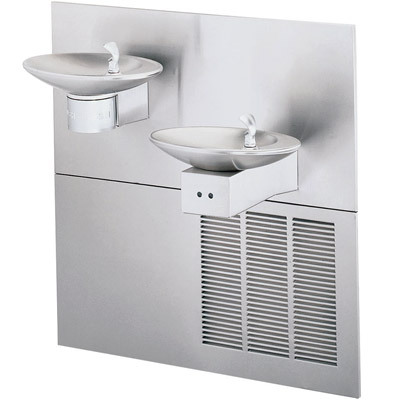 The lower fountain has an electronic eye water control for hands-free operation. Bubbler is chrome plated, two-stream, mound building type. Cooling unit has a high efficiency positive start compressor using R134A refrigerant, with pressurized counter-flow cooling evaporator/chiller. When properly installed, unit meets state and federal requirements as defined by the Americans with Disabilities Act for both children or adults. Unit is certified to NSF/ANSI 61 and meets requirements of the Safe Drinking Water Act. Unit complies with ARI Standard 1010. Oval shape fountain, non-corrosive stainless steel, with brushed satin finish. Contour-formed basin with rounded corners and edges. Oval fountain shape requires less neck extension and bending for the wheel chair user. Self-closing, semi-circular push bar can be actuated at any point on its 180° radius. Constructed of stainless steel, number 300 series with satin finish. Removable lower panel provides access to plumbing and refrigeration system. Panels overlap wall opening 1/2".